Gas Wells | Mothers Against Wind Turbines Inc. 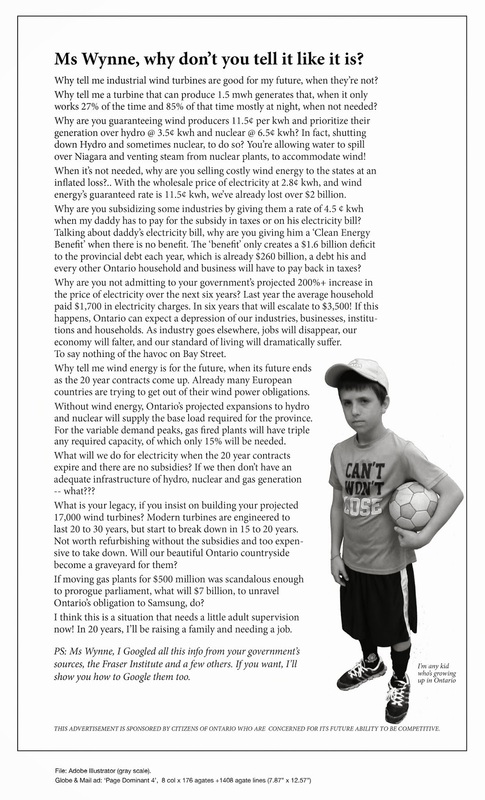 The Long-Term Energy Plan review now underway in Ontario demands our attention despite its sleep-inducing name. The choices the Wynne government makes will affect your pocket book, our economic competitiveness and the health of our environment. And already the review has delivered a bombshell. Earlier this month, without waiting for the final analysis, expected later this year, Energy Minister Bob Chiarelli announced that “new nuclear will not be part of the long-term energy plan.” He maintains Ontario has a “comfortable surplus of electricity” and won’t need to spend upwards of $26 billion to build new nuclear plants. I don’t get it . Chiarelli states that we here in Ontario have a comfortable surplus of energy. If that is the case and we have no need to build new nuclear facilities..then what is the point of adding more useless wind turbines? Does anyone have a clue yet that, although the wind back-up gas plants are economical now..in a short time as those prices become tied into the global market, running those plants will also become expensive. If the Liberal government is committed to conservation and planning wisely for the future then that practical path should include rethinking their our investment in useless wind and solar. Predicting the province’s energy future is not an exact science. New technology will change the relative advantages of our different energy sources. Greater attention to conservation could further shrink demand. At the same time, massive developments like the “Ring of Fire” mineral find in Northern Ontario and a slow renaissance in manufacturing could increase demand. Saving billions by not investing in new nuclear plants is supported by the best available analysis. With that decision made, the minister should shift his attention to containing future energy costs for consumers and business. Also this interesting graph from the UK. Anne and Ed Fairfield will be interviewed by Dale Goldhawk on his “Fight Back” Show today, please join the call! They will be discussing their recent letter to Kathleen Wynne and her Ministers, the MOE Director Vic Schroter, Tim Hudak and Brian Treble. This is about a Gas Well situation on Sixteen Road that was properly installed many years ago near the Road Allowance. Now the HAF Wind Energy Project wants to bury the Electrical Collector Line within 5 metres of one Gas Well. The MNR Policies and Regulations say that nothing should be installed within 75 m of a Gas Well, and the proponents have no Engineer’s Report (required) to say otherwise, nor were they asked to produce one. This case has reached the point where the Health and Safety of a very densely populated rural area of West Lincoln and Hamilton is threatened if no immediate action is taken. There are 244 homes and families (not just receptors) within 2 km of these 5 Industrial Wind Turbines. Members of our community have told the MOE last year in the Commenting Process about our Gas Wells concern, yet the proponents and the Ministries granting Approval have not been held to account. Non-commercial natural gas may be odorless, tasteless, and colourless. A private Gas Well may also produce gas containing Hydrogen Sulphide, which is poisonous and should be treated with caution It is fatal to humans in small concentrations and causes rapid corrosion of pipes. These Gas Well pipes are very old, and do not need to be corroded any more. They also connect to a house. When we can smell sulphur at our water taps, it is a good indication that Hydrogen Sulphide is around. The very fact that we have Gas Wells in West Lincoln, and most of us rely on our Water Wells, indicates to us that we have a very short term problem now and a longer term problem ahead with Fracking for the Gas. Tune in and call in with your questions or concerns to 1-866-740-4740 or 1-416-30-0740 to Dale Goldhawk on Zoomer Radio Am 740 after 11 a.m.